PRICE: $13.00 which includes US shipping. This sheet is a bit smaller than the norm, which explains the lower price. It still contains markings for six grey jets. The selection is quite nice and offers some good options. We start out with an F-18D from VMFA-533 in 2009. This aircraft is ATARS equipped so you'll need a conversion set for it. That info is provided in the instructions. Next is an AV-8B+ while on deployment aboard the USS Makin Island in 2014. This explains the YP tail codes and VMM-163 unit name. 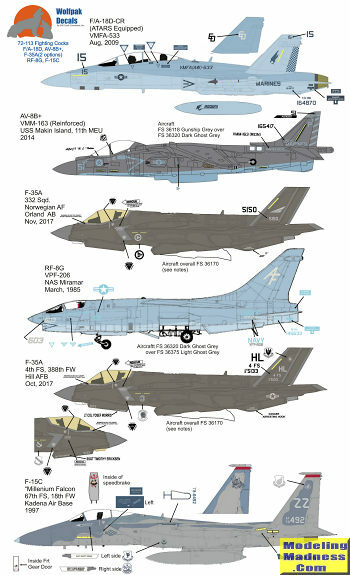 A Norwegian F-35A from 332 squadron in Nov 2017 is next. The 'oldie' on the sheet is an RF-6G from VFP-206 in the last year of their operation; 1985. This was based at NAS Miramar. The second F-35A is from Hill AFB in October 2017. It is the boss bird of the 4th FS. Finally, an F-15C from the 67 FS based at Kadena in 1997. It has artwork and the name 'Millenium Falcon' on the inside of the speed brake. There are good kits for all of these options so finding one that works for you will not be an issue. Some of these will require upgrade sets and that information is provided. The decals are superbly printed by Fantasy Printshop. 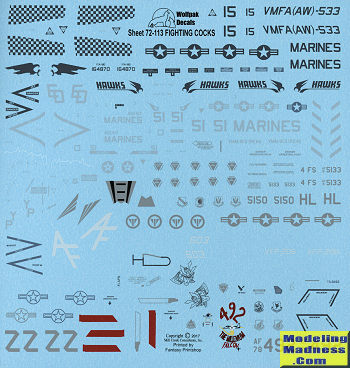 Thanks to WolfPak Decals for the review sample and the image of all the options as their cover sheets are too long for my scanner. Visit them at their web site and pick up yours.